Once you know how to organize your closet quickly and efficiently, you’ll be able to keep your things in order! I don’t know about you, but there is something so discouraging about digging through a pile of shoes to find a belt or dumping out an entire drawer to find a pair of matching socks. Below we’ve listed a couple of easy ways to get your closet clean and organized. First thing’s first. DECLUTTER. You’ve got to get rid of everything and anything you don’t wear, use, or need. If it doesn’t fit or is something you simply don’t wear, donate it. If it is torn or stained, toss it. You’ll be shocked how much easier it is to keep things in order when you don’t have things you don’t need spilling out. Once you’ve cleared out your space and have minimized your closet’s contents, decide where you want everything to go. Things you use the most should be at eye level, things you somewhat use should be on the floor, and your least used items should be stored on the shelf above. Use boxes, bins, or baskets to store smaller items and keep them separate from everything else. Each item of clothing should have its own hanger or shelf to live on and if you can fit a shoe rack in, do it! Seriously, the more consistent you are in keeping things where they belong, the easier it will be to keep your closet organized. One of the most important things in keeping your closet organized long term is making sure each thing you use is easy to put away. If you have to take the lid off a box every time you want a pair of socks, you’ll probably end up just tossing them into the bottom of your closet. Keep things simple to keep it organized. So there you go! Simple enough, but why is it always so tricky to keep up? I’ve started cleaning out and organizing my closet every couple of months and it’s helped keep things under control. 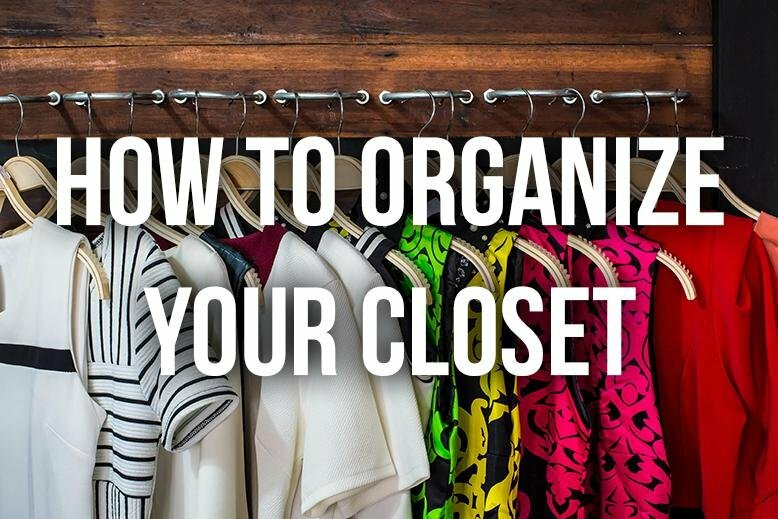 Have you found any tricks or tips that help you keep your closet organized?